There is no other U.S. bitemark that stands higher in the Pantheon of the forensic odontology community than the Ted Bundy case. His trial for the murder of two sorority members in Tallahassee, FL showcased numerous examples of bitemark expertise involving evidence from one of the victims. 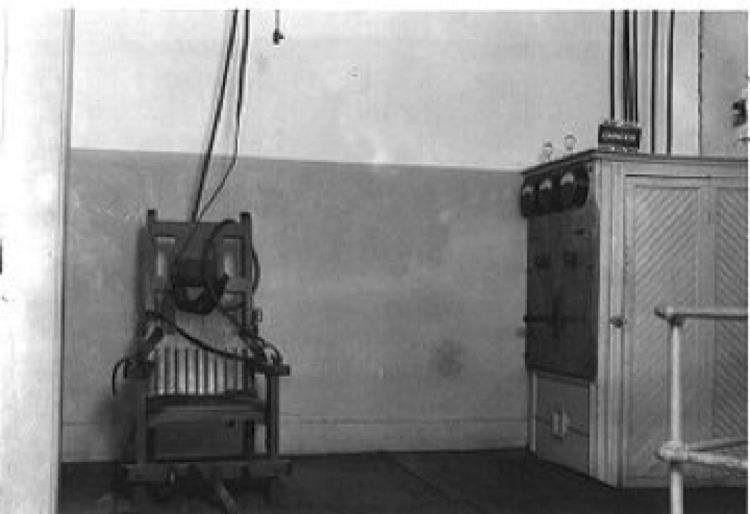 This case often is said to have sent Ted to his execution by “Old Sparky”, the electric chair at Florida State Prison, in Bradford County, but that death sentence and his 1989 execution derived from a separate death penalty trial in that state. Revisiting forensic dental evidence from “old” closed cases is something that crime writers generally do. John Grisham in his 2006 non fiction work, The Innocent Man, spotlighted the 1985 State v. Wilhoit murder conviction that was helped by 2 dentists using oral bacteria components (a flawed pre DNA theory) as well as a bitemark injury to identify the defendant as the biter. A defense-selected 11 dentist panel helped reverse the conviction in 1991. The forensic dental community seems a bit wary of a top to bottom review of their more recent bakers’ dozen (or more) of bad bitemark expert performance in cases later overturned and determined to be wrongful convictions or incarcerations. Also, the New York Innocence Project has a list of similar cases located on their website. All of these cases involved ABFO certified odontologists making incorrect bitemark identifications. Lengthy appeals ensued. 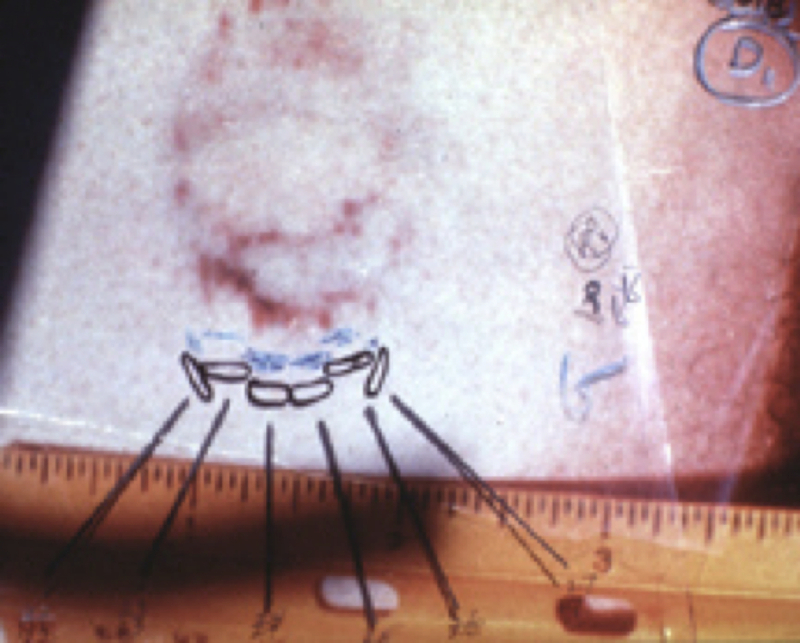 Three years after the trial, one of original defense dentists matched the Kandel bitemark to a bitemark confessed to by a convicted serial murderer named Richard Macek. One of Milone’s appeals also used the process of having a 4 member cohort of defense dentists. In 1986, they again argued against the 3 prosecution bitemark dentists’ 1973 conclusions that Milone was the biter by substituting the known serial killer Macek as the actual biter. In the same year, Milone petitioned the governor of Illinois with a claim for unconditional clemency. This officer convened a panel of 3 more dentists, who evaluated the bitemark evidence in Milone and determined Macek could not have bitten Kandel and Milone was the biter. Various efforts continued in Illinois and Milone was released from prison in 1992. It seems in the face of these battling dentists, the “excellent” bitemark evidence in Milone was a bit of forensic overstatement. So, what about State v. Bundy? 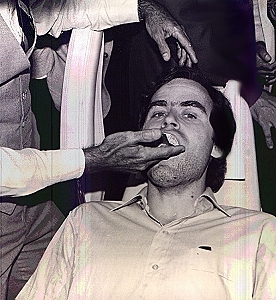 Nearly contemporaneous with Milone, (1973 versus 1979), some of the same players once again presented themselves on opposite sides of the bitemark evidence. The case was a career making event for those involved for the prosecution. The injury on the victim’s left buttock is red bruising. Look closely at this long range monochromatic view. One issue to consider in a bitemark case is the presence of “multiple bites” at the same anatomical position. This can make for a difficult time in determining specific teeth marks. The other issue is whether the skin can reproduce a correct replication of the biting teeth. New research indicates the biomechanics of skin and biting pressure produces uncorrectable pattern distortion. This leads to subjective and unreliable interpretations (usually discounting any discrepancies as “explainable”) during comparisons with suspects. A fuzzy color image of two overlapping bitemarks. One is more faint than the other. 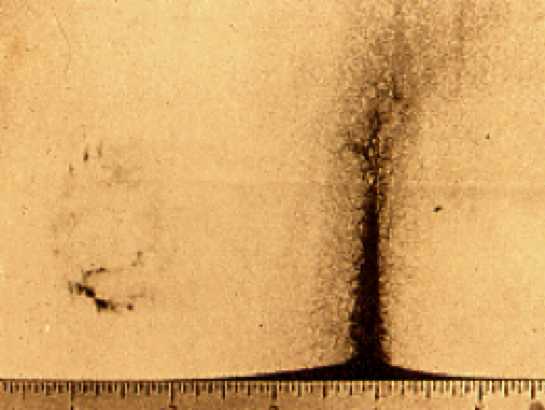 This image is the original bitemark photograph with two transparent overlays superimposed. One of the overlays is a hand drawn “hollow volume” type depicting the lower front teeth of Bundy. The second overlay (in blue) is a felt pen (?) drawing of the edges of Bundy’s teeth. 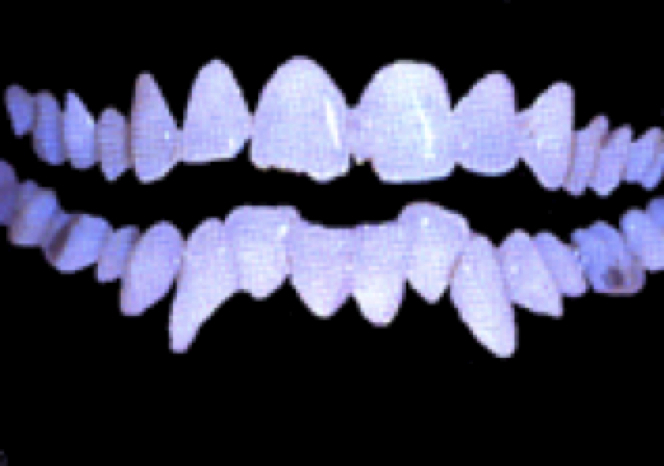 Look closely and you can see differing values of teeth area and definition between the two methods. The prosecution experts determined the pattern was unique to Bundy. This assumed concept was used in court then and even now despite the arrival of DNA. It was commonly stated that every person had a dental profile of biting teeth that was individual to them; specifically analogous to a fingerprint. There should be little argument that Bundy’s lower teeth could make a pattern similar to what is seen in the autopsy picture. Are his teeth and the bitemark unique to just him? No. The scientific issue of could someone else’s teeth have created the same pattern is now much clearer. The probability of another’s teeth duplicating the Bundy bitemark is a fact. Looking at the past helps science move on. However, the recent US exoneration cases also commonly have the dentists making the erroneous claims still supporting their original findings despite scientific and judicial results to the contrary. In our 2011 world, some forensic people stick to their beliefs and don’t really care how they got there. A 2008 Chicago Tribune article describes this odd scientific juxtaposition of opinion in greater detail.